At the moment at which my hands run over the keyboard once small glance through the window tells me it's still snowing like there's no tomorrow. 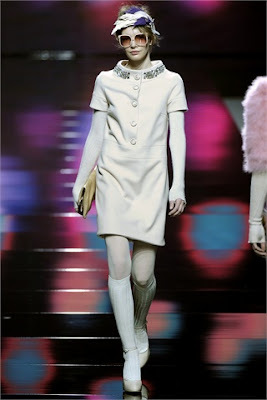 While I'm pondering whether I should get my furcoat (faux, of course) when I will eventually I venture outside, I decide it's time for a couple of words about the Blugirl collection for Fall 09 presented in Milan. The first part of it is entirely pastel-colored and extremely feminine, girly. With bows, ruffles, minidressses (why, of course). Then the colors shifted into dark blue and black, having a classier edge once it was getting closer to the end. What made consider taking my own ( faux) fur coat today was the view of someting like this, inbetween college-girl look and girl-round-town look. Side question: Why on earth would you need sunglasses while wearing such an outfit? Any ideas? I had some hesitations regarding the photo above, but on certain conditions, it colud settle on a fine. Check out more colors and adorable craziness going through the entire set of runway photos. Now that I'm all colors and butterflies, I can continue my day. Have a amazing one too!